The fight to stop the widespread damage to agriculture and the environment caused by wild dogs and foxes will be fortified with two new poison baits – Dogabait and Foxecute® – now available for use in Australia. This major collaborative research and development investment between Animal Control Technologies Australia Pty Ltd (ACTA), Australian Wool Innovation (AWI) and the Australian government through the Invasive Animals CRC has resulted in the first new predator toxin in 50 years becoming available, since 1080 was released on the market. 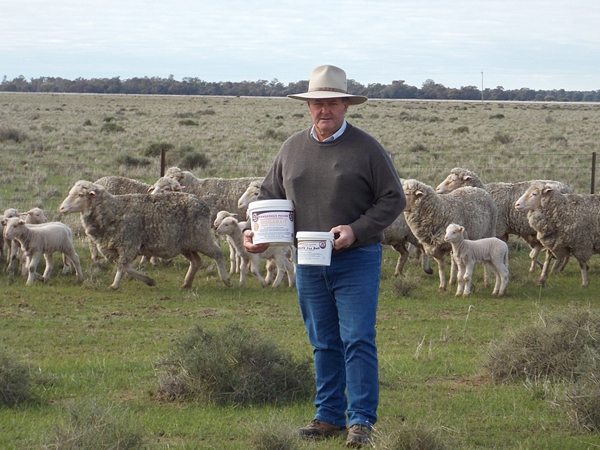 Ian Evans, On Farm Program Manager for Australian Wool Innovation with the new predator baits (image supplied by AWI). The new baits contain a chemical toxin called para-amino propiophenone (short name PAPP) which causes a targeted and quick death to wild dogs and foxes when consumed. Unlike other predator toxins, these new PAPP bait products have an effective antidote, which needs to be administered by a vet. However due to the fast acting nature of the baits, normal precautions and notifications must be undertaken to protect pets and working dogs during baiting programs. PAPP bait products are available for sale to approved users and come under the same restrictions as purchasing and using 1080 baits. Use of the PAPP bait products differs between states and territories, so it is recommended checking with your local authority before use.